“When it comes to concocting the complex mix of molecules that makes up fibers of natural silk, nature beats human engineering hands down. Despite efforts to synthesize the material, artificial varieties still cannot match the natural fiber’s strength. But by starting with silk produced by silkworms, breaking it down chemically, and then reassembling it, engineers have found they can make a material that is more than twice as stiff as its natural counterpart and can be shaped into complex structures such as meshes and lattices. The new material is dubbed regenerated silk fiber (RSF) and could find a host of applications in commercial and biomedical settings, the researchers say. The findings are reported in the journal Nature Communications, in a paper by McAfee Professor of Engineering Markus Buehler, postdoc Shengjie Ling, research scientist Zhao Qin, and three others at Tufts University. Some kinds of silk produced by spiders are among the strongest materials known, pound for pound. But unlike silkworms, spiders cannot be bred to produce the fibers in useful amounts. 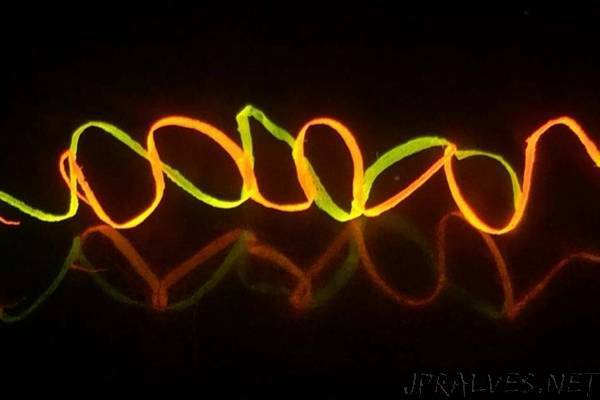 Various researchers, including Buehler and his collaborators, have attempted to make purely synthetic silk instead, but those efforts have not yet yielded fibers that can match the strength of the natural versions. Instead, the team has now developed a way to harness the best qualities of natural silk produced by silkworms, while processing it in a way that makes it stronger and opens up a wide variety of new shapes and structures that could never be formed from natural silk. The key is to break down the natural silk, but not too much, the team says. That is, they dissolve the cocoons built by silkworms, not to the point that the material’s molecular structure breaks down but rather into an intermediate form composed of microfibrils. These tiny, thread-like assemblies preserve some of the important hierarchical structures that give the silk its strength. Though silk thread and fabric are expensive, the material’s cost comes mainly from the labor-intensive process of unraveling the thread from the cocoon and weaving it, not from the actual production of the silkworms and their cocoons, which are quite inexpensive, explains Ling. In bulk, unprocessed silkworm cocoons cost only about $5 per kilogram (2.2 pounds), he says. By breaking down the silk and then extruding it through a tiny opening, the researchers found they could produce a fiber twice as stiff as conventional silk and approaching the stiffness of spider drag-line silk. This process could open up a variety of possibilities for new uses. For example, silk is a naturally biocompatible substance that does not produce any adverse reactions in the body, so the new material could be ideal for applications such as medical sutures, or scaffolding for the growth of new skin or other biomaterials. Such forms can be created by using the reconstituted material in a kind of 3-D printing system customized for silk solution, Qin says. And one advantage of the new process is that it can be carried out using conventional manufacturing technologies, so scaling it up to commercial quantities should not be difficult. The specific properties of the fiber, including its stiffness and toughness, can be controlled as needed simply by varying the speed of the extrusion process. These reconstituted fibers are also very sensitive to different levels of humidity, and they can be made electrically conductive by adding a thin coating of another material such as a layer of carbon nanotubes. This could enable their use in a variety of sensing devices, where a surface covered with a layer or mesh of such fibers could respond to the press of a fingertip, or to changes in the ambient conditions. One possible application, for example, might be a bedsheet made from such fibers, Buehler says. Such a sheet could be used in nursing care facilities to help avoid bedsores by monitoring pressure and automatically warning caregivers when a patient has been lying in the same position too long with pressure in a particular area of the body. Such applications could be made practical very quickly, he says, as no real obstacles remain to producing material suitable for such uses. “This is neat research that draws on a powerful blend of the interdisciplinary strengths of the MIT and Tufts labs,” says Anthony Weiss, a professor of biochemistry and molecular biotechnology at the University of Sydney in Australia, who was not involved in this work. “The technology has the potential to lay the foundation for new types of woven materials and functional composites — these could be for a whole range of uses, such as a new generation of textiles and biosensors,” he says.